This is distinguished by its location photography and the tough performance of Dorothy Malone. 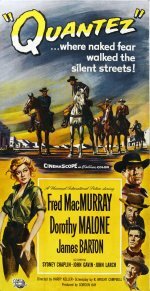 Unfortunately, Malone is paired with an ageing, though still top-billed, Fred MacMurray and callow John Gavin to little advantage and the slow-paced tale about a group journeying to Mexico through Apache territory becomes a bit of a drag. It's worth watching to see James Barton, the Broadway star of Paint Your Wagon, as a travelling salesman and for Dirty Harry's John Larch as an outlaw.